These are not the first trousers that I have ordered from the very good folks at Spencers Trousers, that honor goes to two pairs of corduroy trousers I ordered last year and which will be the subject of a coming review. This review, however, is very timely given the weather we've had in Bavaria of late. 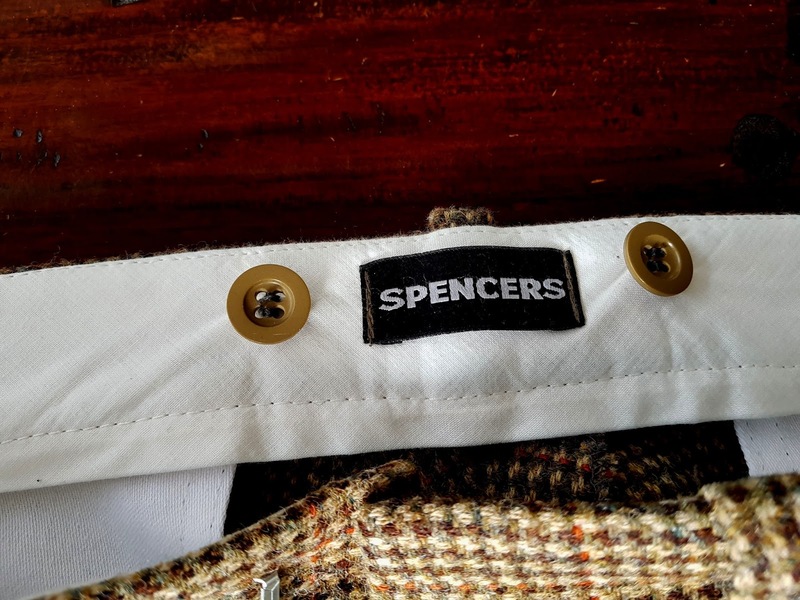 Spencer's is a firm, as their name implies that specializes in appropriate coverings for the male legs (a worthy endeavor, as any visit to a beach in Summertime, will confirm). Founded by JWR Spencer in 1922, after the Great War (sadly NOT the war to end all wars). Spencers is a 'made to measure' tailoring company that will happily and expeditiously make a pair of trousers, Plus 2s or Plus 4s to any specification you desire. They've got a great new website, which is a breeze to use with a fairly straightforward order form. They are located in "The Upper Calder Valley in West Yorkshire has long been associated with high-quality cloth and trouser manufacturing. 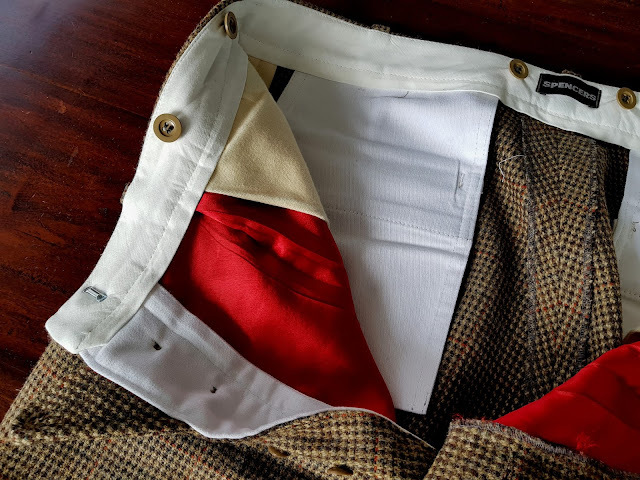 Spencers Trousers continue this tradition using locally sourced cotton and woolen cloth to provide you with the best quality Made to Measure Trousers, Plus twos/Plus fours and Breeks." 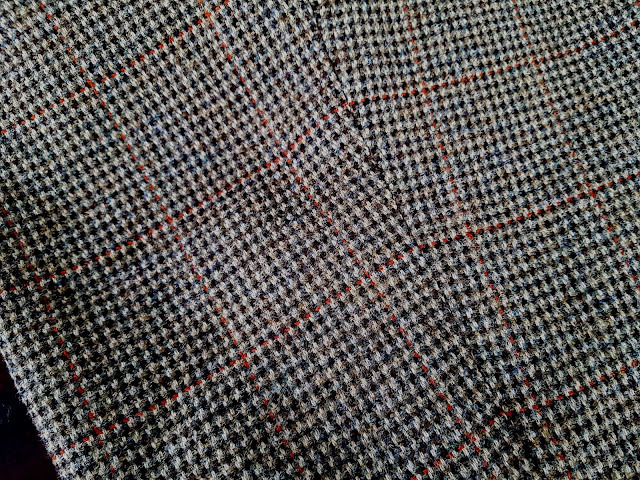 My Trousers were made from the aforementioned olive small houndstooth tweed with subtle orange over-check and feature button fly, bracer buttons, turn-ups and really great red satin half lining. 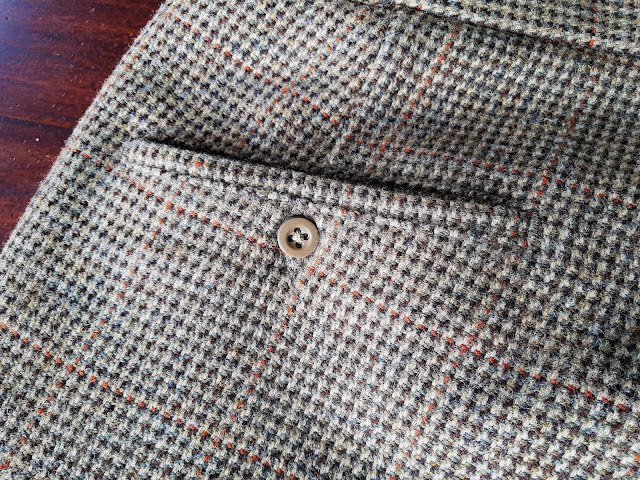 I also added moleskin from pockets made from heavy duty moleskin (the same weight used to make their moleskin trousers) which add even more coziness to ward away the cold Bavarian winter. Of course, they are happy to forgo belt loops for Bracer buttons (or include both). Fishtail back and side or back tabs? Not a problem. They will gladly add these, often at no or very little extra charge. Low Rise, High Rise or anything in between. Wide leg, tapering, straight or stove pipe, whatever your heart desires. 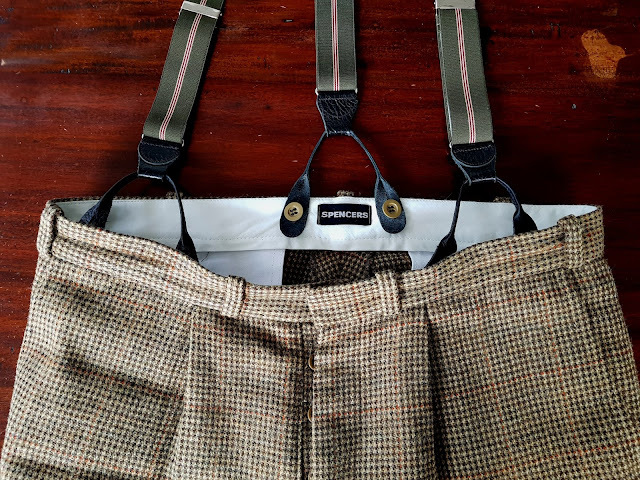 I myself provided measurements off a pair of Chinos from Bravestar Selvage, that I thought would be great for custom made-to-measure and the fit was a perfect match, with just the right taper in the leg I was hoping for. Now that I've got the basic fit I prefer sorted with Spencer's, I can tweak the details in any way I like on future orders. 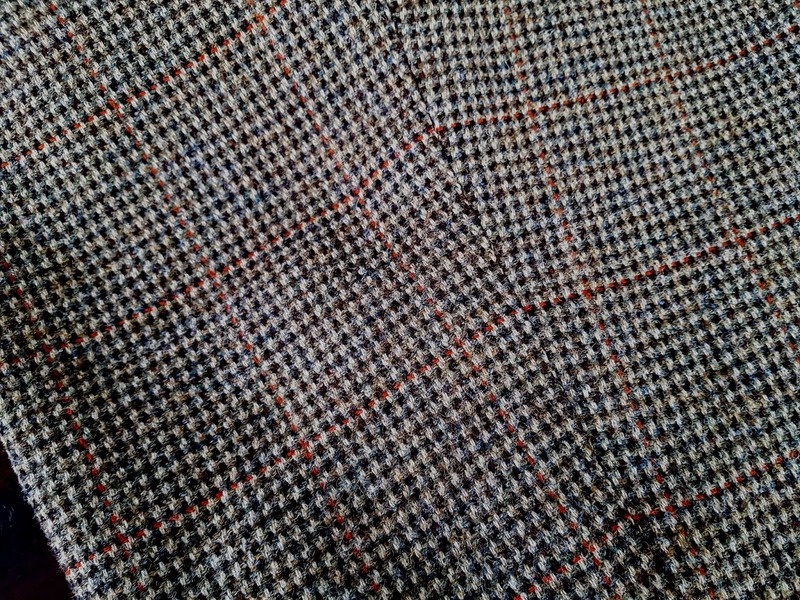 In my inexperience, I had ordered this pair of Tweeds with belt loops, which in hindsight unnecessary. 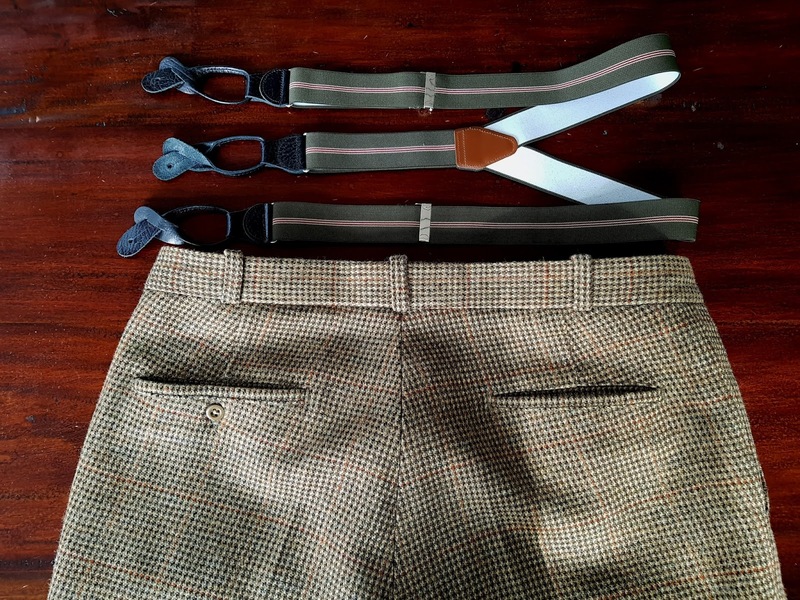 I realize that I only wear these with braces, as the weight of these trousers, make wearing a belt on my physic pointless. No matter, this will be corrected with future orders. I think my next tweed order will include a change pocket, high fishtail back, and back tab. 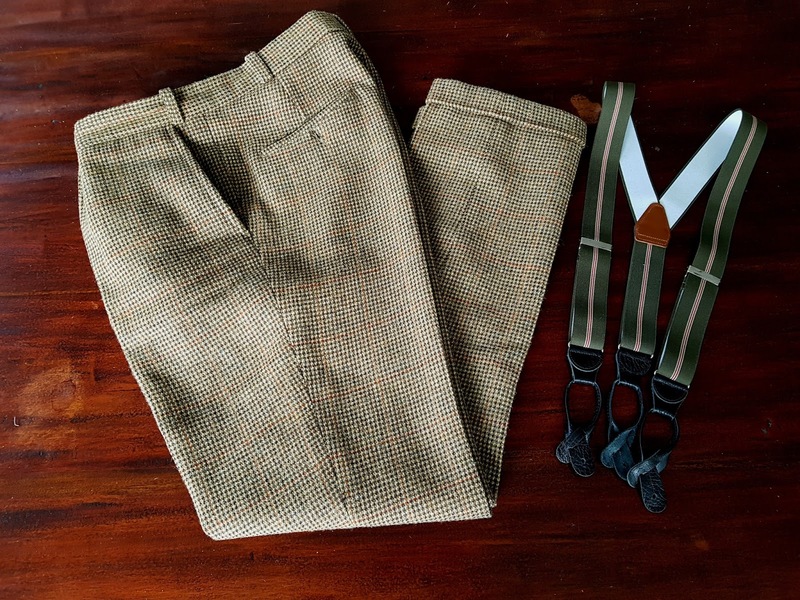 The best part is after completing all the details of your order, they will make-up your custom trousers and dispatch them out to you in only SEVEN days!! No waiting weeks for these custom items from Spencer's! I've consistently received my trousers within 10 days from the time of order to the time that I'm stepping into my newly made garment. 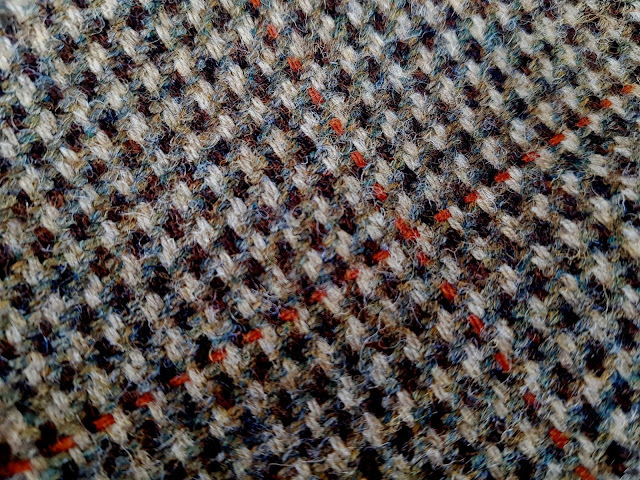 So there is plenty of time to order and enjoy your cozy new tweed for this season! Nigel is the fine chap that I've dealt with on all my questions and he has replied to my every question with the kind of expertise that only comes with years in the trade (I think he may also be their cutter). Needless to say, Nigel's friendly and expert advice has been invaluable. 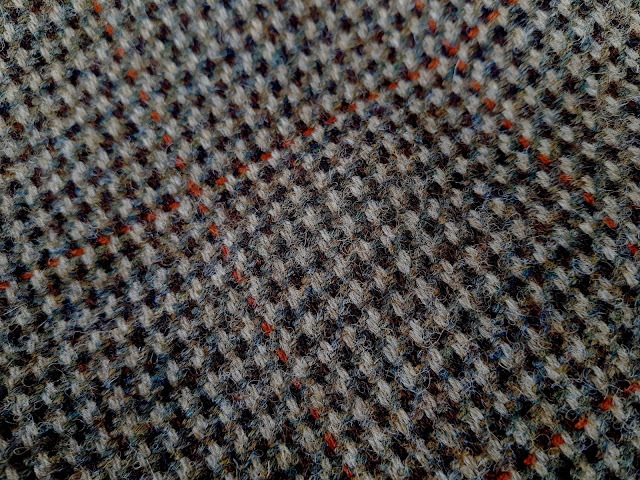 Overall I couldn't be more pleased with the final results and service with ordering my first of what I'm certain will be many pairs of tweeds to come from Spencer's Trousers. In fact, I'm already in the early planning stages for what will come next!